For most freelancers, having a strong portfolio that shows what they can do is far more powerful than simply telling potential clients what they can offer them. One way to really show what you can do is by doing a teardown - in this article, we’re going to explain exactly what this is and how to do one yourself. A teardown essentially involves breaking down the components of a product or website in order to identify and analyze key parts and how they are working looking for improvement’s opportunities. Easily put, it’s kind of giving feedback from your professional point of view about the product at hand. That means that your teardown will be mainly focused on your niche. If you are a web designer, you’ll focus on analyzing the design of the site and the things that can be improved: colors, figures, pages, positions, etc. If you are a UX designer, this will be your main focus: Does the user understand immediately what the website is about and what the next steps are to do what he wants to? If you are a business consultant, you might want to discuss the business model or pricing strategy of a particular service. A teardown can be excellent at showing what elements of a website may not be working effectively, allowing you to really showcase your skills to potential clients and show them why they need your services. A teardown can be excellent to showcase your skills and show potential clients why they need your services. Connection with potential clients: Creating a teardown for a potential client’s website is an excellent way of connecting with them directly, showing exactly why they need your services as a freelancer and what you can help them achieve. Real examples of your knowledge: There is no better way of providing proof of your experience and knowledge as a freelancer than showing your prospective clients. A teardown shows exactly how you see a website and what you would do to improve it. The same way, you can show how to improve a process other than a website. Brand awareness: While teardowns are useful to show your potential clients, they are also useful for creating more awareness about your brand as a freelancer. Share your teardowns on your social media platforms as evidence of your experience to help further establish yourself as an expert in your niche. Use as a case study: If you take on a client after creating a teardown for their website, this can provide an excellent case study that you can then use as a testimonial on your website. Testimonials are another fantastic way of showing future clients that they’re hiring a freelancer who will deliver. Teardowns focus on multiple elements of a website, analyzing how each one works and whether it positively contributes towards building an environment that may encourage visitors to convert into clients. You don’t have to be targeting a particular client in order to create a teardown. You could instead pick a well-known website in the same niche in which you are looking for clients. In this teardown, for example, Val Geisler chooses to do a teardown of CoSchedule’s email onboarding to showcase her expertise in this field. When creating a teardown yourself, you will need to identify which elements you will be breaking down (below, we identified some of the most common components you might cover, although this list is not exhaustive). If you are a web designer, for example, there are some elements that make more sense to break down than if you are a copywriter. Now you have your checklist of the components you will analyse, you need to go through each one and decide if they need improving on the website you have chosen to include in your teardown. Does the page load within 3 seconds? If not, the website may be losing a huge percentage of visitors simply because of its slow loading time. Does the layout look professional, with a clear logo and branding theme across the page? Aesthetic details like this can make an enormous difference to the first impression a potential client has on a website. Likewise, is the header clear, with concise, well-written copy that explains why the website exists, and who it is for? These details, in particular, should be above-the-fold features that immediately assert the reason for the website existing and who it is relevant to (i.e. your clients). Is the menu clearly laid out, and easy to navigate? Does the website have relevant links to an ‘about’ page, a ‘testimonials’ page, a portfolio? What about a blog page? Or are you left wondering where to click for more information from the home page? This is exactly the sort of thing a teardown should assess. You have been analyzing the web in question or the product that you have chosen and now it is time for you to show your findings, which ones work and which ones you would improve. There are different formats to do a teardown and present your ideas. Of course you can make a combination of all these formats (and any other you might want to use) to offer the teardown to different people that want to consume content in a different way. In the example of Val Geisler that we mentioned before, Val uses her blog to do the e-mail onboarding tear downs and combine screenshots with text. In addition to making her comments as she presents the sequence of emails, she includes examples with improved e-mails that she would use and ends up summarizing the good uses, the bad uses and the ugly ones. 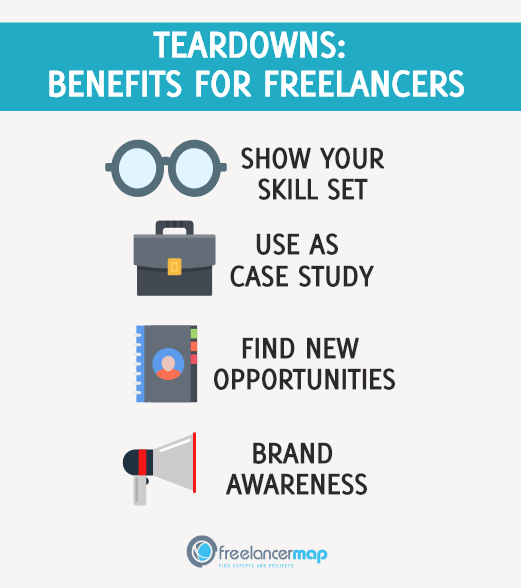 Have you ever done a teardown to show what you can do as a freelancer? Let us know what components you covered in your teardown, and if it helped!